30 weeks of hobby progress! Sheesh, this has been one hell of a ride so far, I’ve really enjoyed the motivational boost keeping this up! There have been times when I’ve not been in the mood or whatever, but the need to have something to report on a Sunday has kept me going with a lot of my projects on the go, as well as prompting me to get more – not necessarily a good thing, but I do like the variety! Which is pretty much what has happened this week! Back in late January, Games Workshop began the rebranding of a number of kits from the more generic Chaos faction as “Slaves to Darkness”, and I really liked the look of those miniatures. I’ve mentioned this before, but the Chaos faction is what I started with when I played Warhammer: Invasion, and rather than all of the various demons, it was these mortal cultists that seemed to make up the majority of the faction that I had come to know. Anyway, I wanted to get these guys, but fought the urge. I’ve come back to the idea a couple of times over this summer, as I’ve been considering getting either these or the Bloodreavers. I’d wanted to work on some painting skills, and was thinking I’d get some chaps like this to practice painting skin. I’ve built up five of them so far, anyway, and while the guys with flails were a bit difficult to get the arms to line up, in the main they aren’t all that bad to do. The real challenge is still to come, of course, as I try to figure out how to paint realistic skin! I’ve been a big follower of the tutorials put out by Warhammer TV, though don’t always like that weirdly highlighted look if I’m honest. I think I might just go for some shade-and-drybrush look rather than going through all the layering stuff. 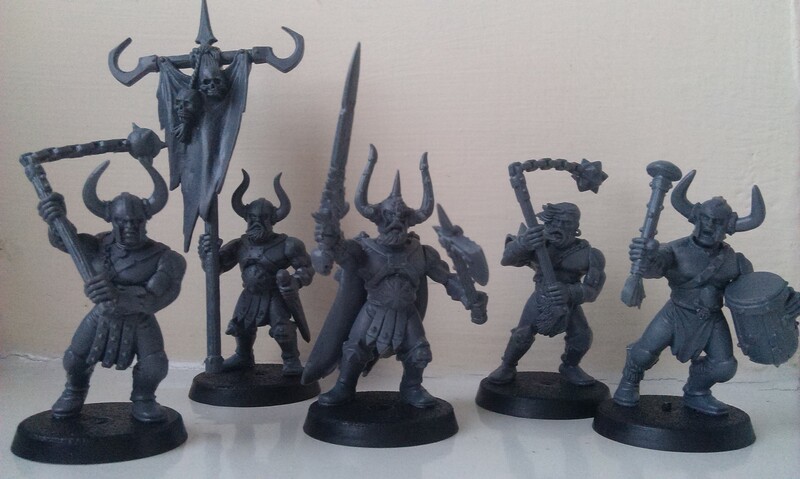 Finally, I’ve gotta say – bravo to GW for these repackaged minis! They really pack these guys in there! £23 got me 20 of these guys, which is a decent stack of sprues in the box! There’s something immensely satisfying about opening a box and seeing that, just waiting to be built into these awesome things!